Horses spend much of their life grazing. And while most of the plants in find in your pasture are harmless, some plants should never be consumed by your horse. Horses get the majority of their nutrition from grass and hay but do you know which plants can harm your horse when eaten? While horses tend to shy away from eating toxic plants, it is important to be aware of what plants are toxic when ingested. After reading this article you will understand which plants to remove from your pasture and how to spot the symptoms exhibited by a horse who has eaten them. What’s the Problem with Ragwort? It's important that you never make hay from a field that has ragwort growing in it as this plant is bitter when alive but palatable when dried and your horse will not even know that it is ingesting this poisonous plant. When ingested, it can cause liver failure or death and it only takes up to 5kg over the life of the horse to be fatal. This plant grows in the western, northwestern, and midwestern United States. It grows best in moist climates that are cool and in well-drained soil. Once your horse has eaten ragwort, it is often too late to do anything to save the animal's life. There is no treatment that is effective; you have to help the liver heal itself by feeding a healthy diet and not placing undue demand on the organ. These gorgeous yellow flowers, while they look amazing scattered throughout your field, can harm your horse very quickly. While horses tend to avoid eating this flower because of its bitter taste, even breathing in the pollen can irritate the nostrils of your horse. The effects will vary depending on how much of the plant was ingested. It is rare for horses to seek out this plant but they will eat it if they enjoy the bitter taste, there aren’t enough other plants for them to eat, or the pasture is overgrown and they have difficulty distinguishing between plants. This plant is common throughout the United States and can grow in most any kind of soil, making them a problem in many fields. If your horse ingests buttercup, you will want to remove it from the place where it can access this plant. Mild symptoms will begin to disappear immediately while medication for convulsions and antibiotics may be needed for mouth blisters to prevent infection and further irritation. About as toxic as yew, Oleander causes heart problems, including cardiac arrest, in horses when it has been ingested. Horses only have to eat as little as one ounce of fresh leaves for the impact to be fatal. They are unpleasant tasting but dried leaves can easily be ingested as they do not taste bad but still retain some of the poison. Oleander is planted as an ornamental plant throughout the southern United States and thrives in poor soil conditions, backyards, and along the road. If your horse consumes oleander, you will want to call the vet immediately. There is no treatment but careful treatment of the symptoms may be able to save your horse if it did not consume a large amount of the plant. 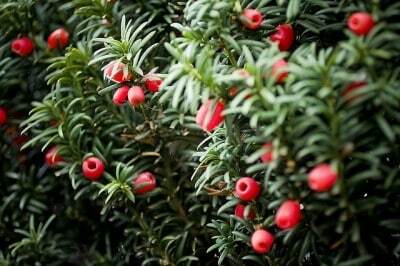 Yew is normally grown as an ornamental shrub. All of the seeds and the needles are poisonous to many animals but the cover of the seed is not. No matter if the yew is fresh or dried, it will still be toxic to your horses because of the poisonous alkaloids common in this plant. It’s important that you do not use yew in your landscaping near your horses. Yew is commonly used throughout the United States in landscaping, which is why you have to be vigilant for this plant. Even though a horse owner will know not to have it growing on his or her property, you do have to watch out for shrubs that your neighbors plant, especially if the plants are near your horse’s field. Once a horse has ingested yew, death is usually so sudden that there is no treatment. It is important to be aware of what vegetation can cause your horse to get sick. If you find any of these plants in your pastures you will want to remove them. If you fear your horse may have ingested any of these plants contact your vet asap.